Yesterday, as we announced tickets going on sale for the forthcoming Veolia Environnement Wildlife Photographer of the Year 2011 exhibition, we revealed three new images that will star in the exhbition that opens on 21 October here at the Museum. I'm already bewitched by this one. 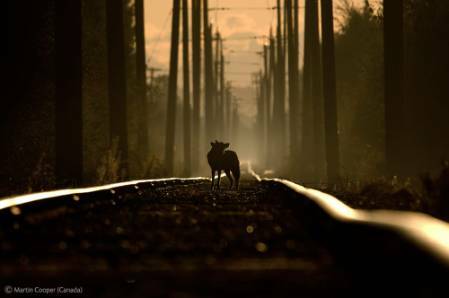 Coyote on the tracks, by Martin Cooper (Canada). Many of us Londoners will be enjoying this breathtaking image close-up before stepping inside the 2011 Veolia Environnement Wildlife Photographer of the Year exhibiton. It will feature in the exhibition's publicity posters. These early-released images join the other 105 commended and winning 2011 photographs appearing in the new exhibition in the Museum's Waterhouse gallery. In the gallery, you'll be able to see them close-up, displayed as beautiful backlit installations, with descriptions and camera details. The winning and commended images were hand-picked from about 41,000 entries, that poured in to the 2011 Environnement Wildlife Photographer of the Year competition. The competition office received images from 95 countries and welcomed Cambodia, Moldova, French-Polynesia, Brunei and Kyrgyzstan for the first time. The jury of photography industry experts spent three months coming to a final decision on the best photos. I'm also told that the overall winner this year has now been chosen, but this information is of course shrouded in secrecy until October. Martin Cooper, who snapped his coyote (above) one October dawn, recalled how the shot was taken at his favourite spot for photographing local widlife on a stretch of railway track in Burnaby, British Columbia. He was actually there waiting for a beaver, but grabbed the moment when he saw the coyote appearing from the undergrowth sniffing for the sign of rodents. It's the spontaneity and the light in Martin's coyote photo that really grabs your attention, as much as the skilful photography and composition itself. And this is true of 13-year-old Ilkka Räsänen's Tern style, one of the other images revealed today (below). Tern style, by 13-year-old Ilkka Räsänen from Finland really impressed judges with its use of light. 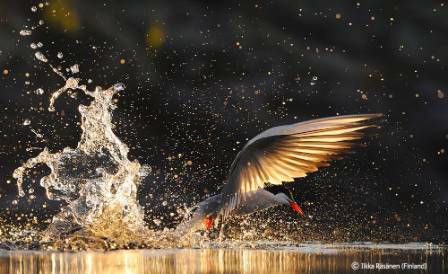 It's one of the highly commended images in the 11-14 year-old category of the Veolia Environnement Wildlife Photographer of the Year young competition, revealed today. Making an impression, by the UK's awardwinning photographer Andy Rouse, is the other image we have a sneak peek at from the forthcoming exhibition. 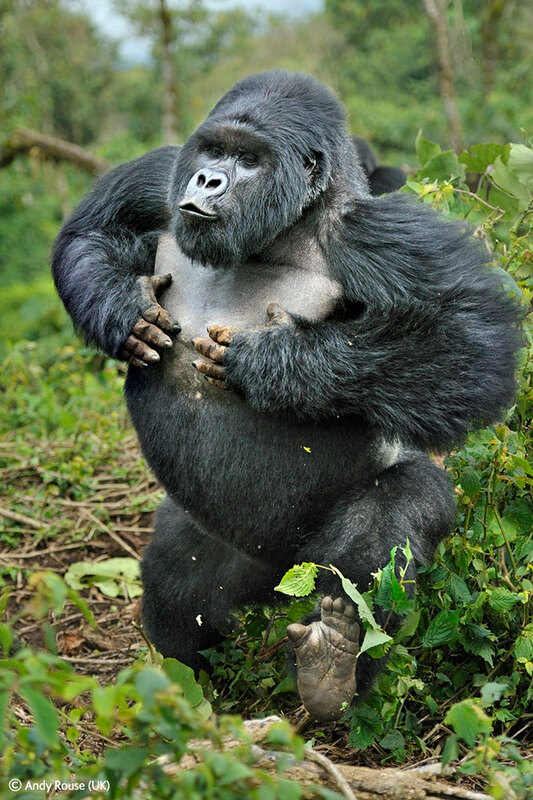 Andy's exuberant photo (below) captures Akarevuro, a young male mountain gorilla, who charged at Andy and his companions in Volcanoes National Park, Rwanda. Making an impression, by Andy Rouse is highly commended in the 2011 Veolia Environnement Wildlife Photographer of the Year competition’s Behaviour: Mammals category. Look out for it in the exhibition.